Devastated housewife of 23 years steps forward to reveal crucial divorce strategies for women strategies that can mean the difference between financial security and figuring out how you are going to survive! Click Here to download the first 15 pages of this MUST HAVE eBook. I'm Leslye Kohl and I want you to take a deep breath...I am here to help you! Download the first 15 pages of this MUST HAVE eBook FREE! THE definitive source of information on divorce. This is your battle plan! 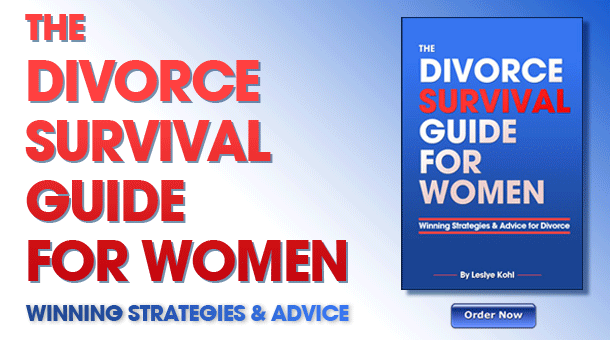 Don’t face divorce alone—Let The Divorce Survival Guide for Women be YOUR guide to Divorce Advice for Women! Divorce is one of the most difficult things a woman can endure. In addition to the emotional difficulties and stress, many women find that their financial security can become severely jeopardized in the divorce process. From ex-husbands hiding assets and clever lawyers finding divorce entitlement loopholes to even your OWN lawyer taking advantage of you in many ways or even selling you out, there are a myriad number of ways for women to feel financially shortchanged by divorce. Luckily, The Divorce Survival Guide for Women is complete with all the divorce advice for women needed to manage a successful and equitable settlement. Take advantage of the experience gained from other women who have gone through divorces and learn what to do to successfully Prepare for Divorce. Because, remember, in your divorce proceedings, just like in any other legal proceeding, knowledge is the key to success—knowledge is power! Prepare For Divorce: My book contains crucial divorce advice for women that will help them navigate the pitfalls of this complicated and emotional process. Divorce can be especially devastating for women, and it is important that they begin learning how to protect themselves in divorce as early as possible. The key to a successful outcome is preparation. Your Financial Security: Although it can take only days to become legally divorced, it can take many years to recover financially if you are not careful. Divorce lawyers are experts at finding ways to cut you out of money—so it is critical that you prepare for divorce and familiarize yourself with their tricks. Divorce Options: It is essential that you not only understand your divorce options, but also exactly what each option consists of. My eBook will help women prepare for divorce by making sense of their divorce options including Mediation, Arbitration, Collaborative and Uncontested Divorce. How to Be A Savvy Client: Just like in any other legal proceeding, knowledge is power. My eBook will teach you what you need to know about divorce in order to shop for the best divorce lawyers. What to Expect Your Husband to Do: Once divorce becomes a certainty, your husband will take every measure he can to protect his assets and shut you out of any money or benefits to which you are entitled. Prepare for divorce wisely and carefully by understanding your husband’s intentions. Your Husband’s Attorneys: Divorce attorneys deal with divorce for a living and as a result have many tricks to strip you of what is rightfully yours. Do not think that you can take on your husband’s attorneys by yourself—learn how to prepare for divorce by selecting an experienced divorce lawyer. Legal Fees: My eBook will educate you on what’s fair and how to avoid receiving unexpected bills from your attorneys. Prepare for divorce by not allowing yourself to be taken by surprise by your husband’s attorney or your own. Settlement: My eBook will teach you how to receive a fair and equitable settlement. One of the most overlooked elements when women prepare for divorce is an understanding of a typical divorce settlement so that they begin the process with realistic expectations. Depositions & Trial: If you’re not a lawyer, the intricacies of the legal process of divorce can be extremely intimidating. This eBook will clearly outline how depositions and trials work so that you won’t be intimidated by any legal jargon or procedures. The Divorce Survival Guide for Women was written by Leslye Kohl, a former happily married wife of 23 years who experienced the pitfalls of the divorce process firsthand. Initially uninformed about how to prepare for divorce, Leslye had learned far too late in the process how to protect herself. She has now dedicated her life to providing divorce advice for women to help them successfully prepare for divorce. So whether you are currently going through a divorce or even thinking about getting one, do NOT wait another minute to read The Divorce Survival Guide for Women! 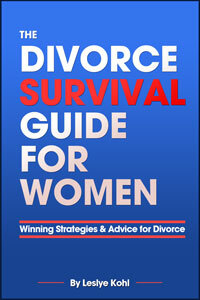 It is truly the definitive source of divorce advice for women handbook. It is never too early to learn how to be prepared—just take a look at our very satisfied reader testimonials! Also, follow Leslye on Facebook, Twitter & LinkedIn, and check out her Blog and Articles at the top of this page and the DivorceIsWar.tumblr.com blog to keep up with the latest news and divorce advice for women! Limited Time Offer!!! Get a sneak peek at the battle plan, Click HERE to download the first 15 pages of this MUST HAVE eBook! 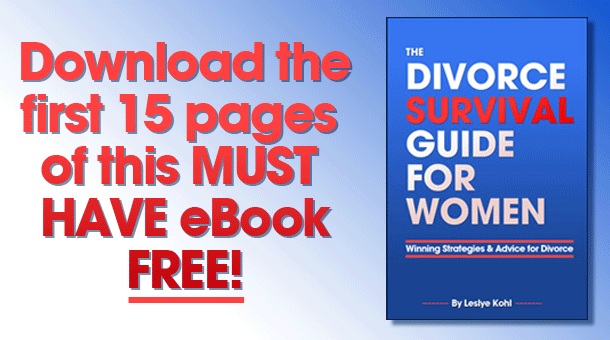 The Divorce Survival Guide for Women is written in plain English! There is no confusing legal jargon—just sincere, well-researched advice that you can immediately apply to your situation!